There is only one reason we set course for the little-known North Carolina town of Kinston and that was to eat at Chef and the Farmer. If you have ever watched the PBS show A Chef’s Life then you too have fallen in love with Chef Vivian Howard and the local farmers and personalities that entertainingly fill her show. Chef Vivian Howard and her husband Ben Knight left their restaurant jobs in New York City and moved back to Howard’s home town of Kinston to open a restaurant. Her parents offered to help financially but there was a catch – the restaurant had to be opened in her home town – a place she vowed she would never live in again. Kinston is pretty much in the middle of nowhere and economically depressed with a 22% unemployment rate. 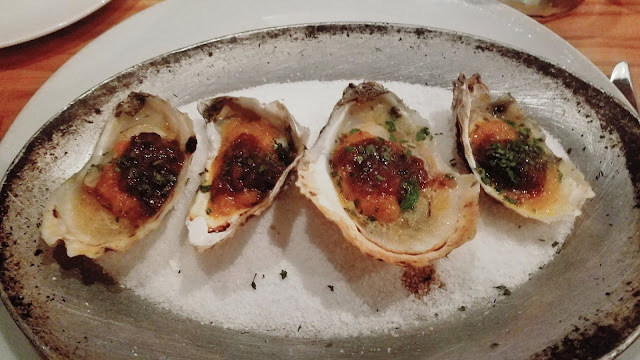 Howard and Knight opened Chef and the Farmer in 2006 and with the help of her PBS show A Chef’s Life it has generated a great fanfare and garnered lots of accolades including two Emmys, a Peabody, and two highly prestigious James Beard Awards. To top that off Howard was nominated as a James Beard Semi-finalist Best Chef Southeast four times (including three of those years in a row). 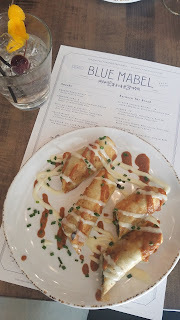 We decided our spring travel plans were going to follow a foodie theme and decided this was a pretty good place to start. People have come from all over the United States to eat at the Chef and the Farmer so we were not an anomaly. 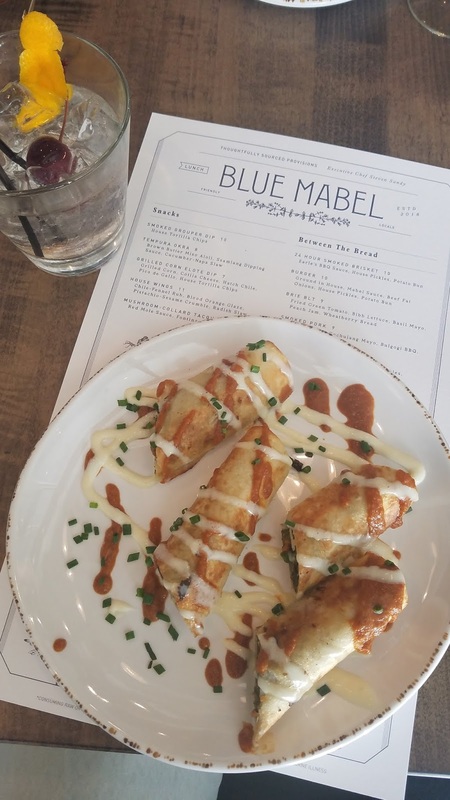 The food was southern creative and absolutely delicious accompanied by impeccable service. We started with craft cocktails accompanied by flash fried collard greens with sea salt which were insanely good. Then we moved onto small plates because we wanted to try lots of dishes. 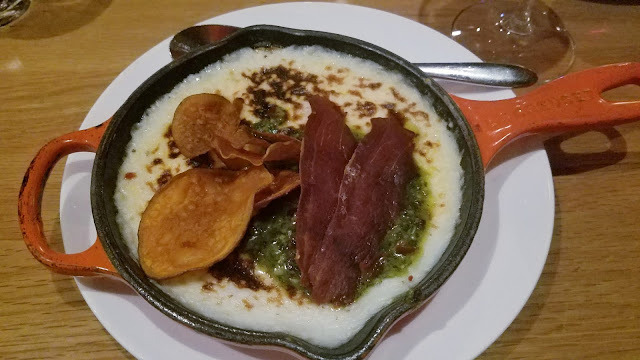 There was fried softshell crab; grits with sweet potato fondue, pecan pesto, and country ham chips; oysters with spicy tomato puree and bacon jam; beef tartare with 64° egg, collard togarashi, gochujang aioli, cashew and sweet potato chips; and a few glasses of wine. Lastly what landed in front of us was a dish of Pepsi ice cream with bourbon caramel sauce, peanuts and vanilla Chantilly. What a way to end a most memorable meal! 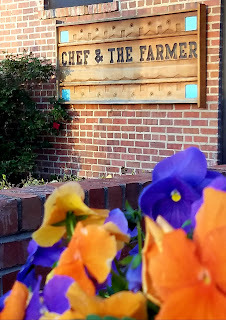 Success of Chef and the Farmer has done wonders for the tiny, dried up town of Kinston with lots of vacant storefronts making the downtown a ghost town. As good as Chef and the Farmer was, it was not the only place in town we found to eat. 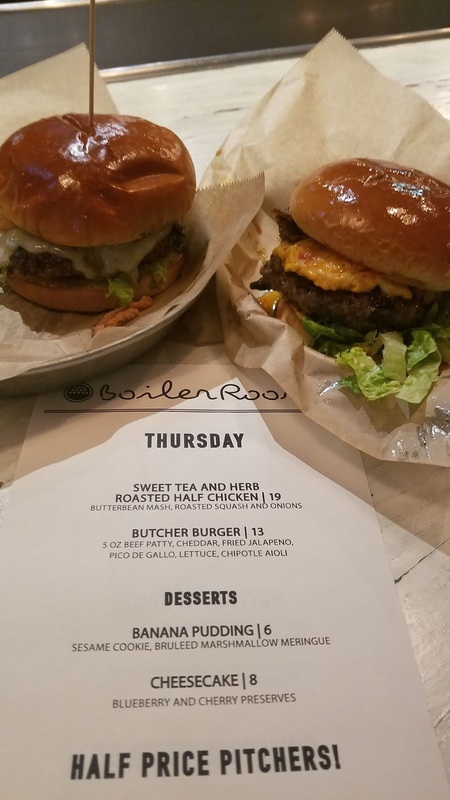 Howard and her husband opened another restaurant The Boiler Room which is a light-hearted casual eatery where oysters and burgers are the stars of the menu. We started with a fried oyster appetizer and then went the burger route. The tasty creation I selected has a distinctive southern flare with pimento cheese, pepper jelly, bacon, greens and spicy mayo. Betsy chose a burger with mushrooms, gruyere, aioli, and crispy onions. Both were delicious and it is clear to us why both restaurants are so successful. Two other places worth noting are Sugarhill Pizzeria which makes a great pizza pie (and sells by the slice) and the fresh fried pork rinds and skins they make at the Farmers’s Market (Tues. and Sat.). Downtown has also attracted some diverse places to wet your whistle. There is a Middle Grounds Coffee Shop when in need of a java jolt. Mother Earth Brewing and Spirits serves up a wide selection of craft beers and Social House Vodka that is there for those who want something a little stronger. 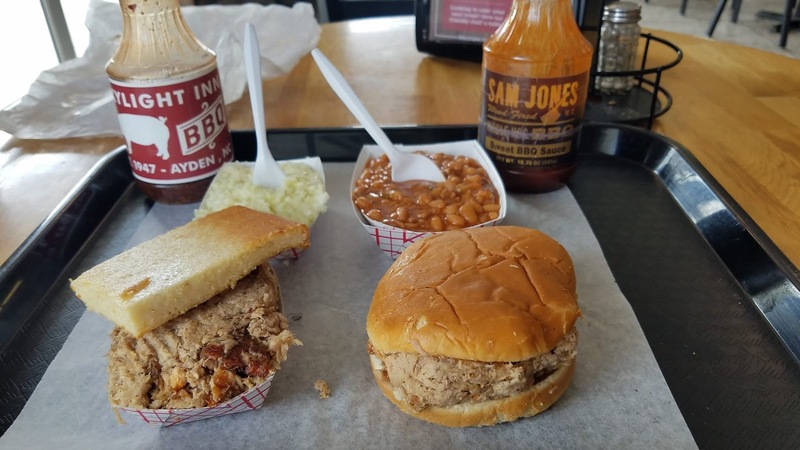 Kinston is located in eastern North Carolina which is proud of their barbeque heritage flaunting the fact that they are the number two producer of pigs in the U.S. so BBQ in North Carolina means pork is on the plate. We headed fifteen miles up the road to an old establishment called the Skylight Inn which has been making BBQ since 1947 and won a James Beard “America’s Classic” Award. Their whole hog is wood grilled instead of smoked so you taste the delicious sweet rich meat instead of smoke. Crispy skin is mixed in with the tender meat making for an amazing crunchy rich bite. Skylight Inn offers two kinds of meat on their menu – pork and chicken – and four sides – corn bread, baked beans, coleslaw and potato salad. There are not a lot of choices but that’s because they do a few things and do them well. We gave eastern North Carolina BBQ two thumbs up. 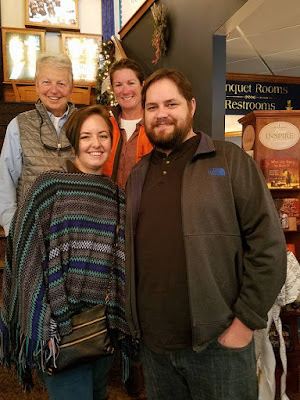 We came to Kinston for food but found out there was more – as is always the case. One of the most popular attractions in the town is the CSS Neuse Civil War Museum ($5 admission charge) which houses a Confederate ironclad gunboat. The Neuse was built in 1864 to transport Confederate troops and goods down the Neuse River to the town of New Bern to help stop advancing Union forces and reopen the crucial trade route. The boat didn’t see much combat action and spent a bit of time aground as the heavy ironclad boat had a hard time navigating the narrow and shallow Neuse River. After her last battle, she was set ablaze to prevent the enemy from capturing her. In the 1960’s a group of local men decided to resurrect the ship but ran into issues regarding ownership. The state bought the boat and continued the resurrection. 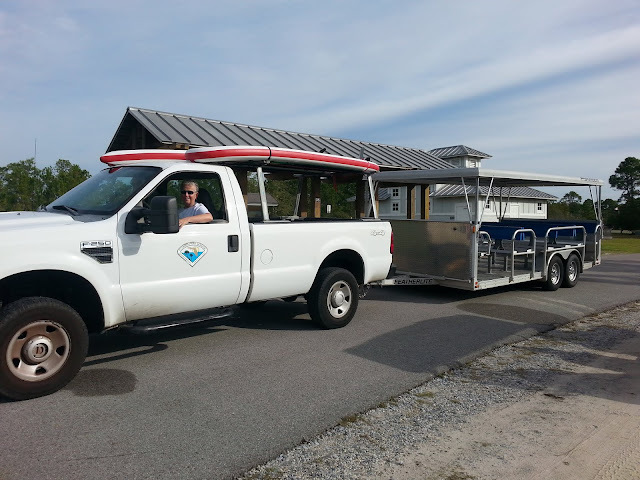 In 2009 she got a proper home in her current facility where the boat is flanked with interpretive exhibits and films about her history and Kinston. Kinston is the hub for the African American Music Trail in eastern North Carolina and is celebrated in the Kinston Music Park. Here NC musicians who played jazz, rhythm and blues, funk, gospel, and rap are celebrated. Kinston’s music scene included some of the greats like Duke Ellington and Louis Armstrong. 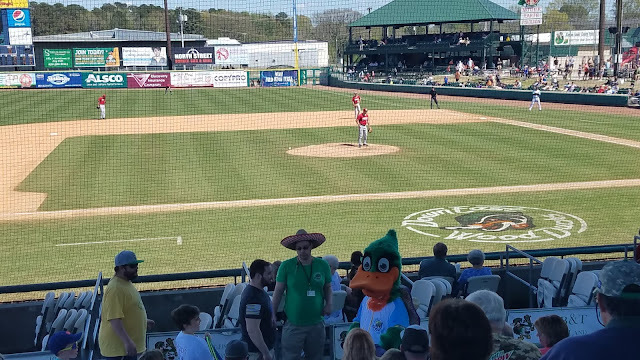 In 2017, the Down East Wood Ducks (a Texas Ranger’s minor league baseball team) came to town and boy does Kinston love their Woodies. On game days, local businesses have their Wood Duck signs out advertising that today is game day and everybody is sporting a Woodies t-shirt or hat. We are particularly fond of minor league games where the atmosphere is light-hearted and fun. You don’t have to park a mile away and spend a Benjamin for a fun afternoon at the ball park. The best part … every seat in the house is a good one. Kinston was quite the pleasant surprise for us and we ended up staying for a week. We camped at the Neuseway Nature Park which has a small campground right on the Neuse River and within walking distance of Chef and the Farmer and other downtown eating and drinking establishments. All sites are 50 amp full hook-up for $20/night. The park is a gem for this small town as it also has a nature center, planetarium and Health and Science Center, large playground, picnic pavilion, fishing piers, and a train for kids. 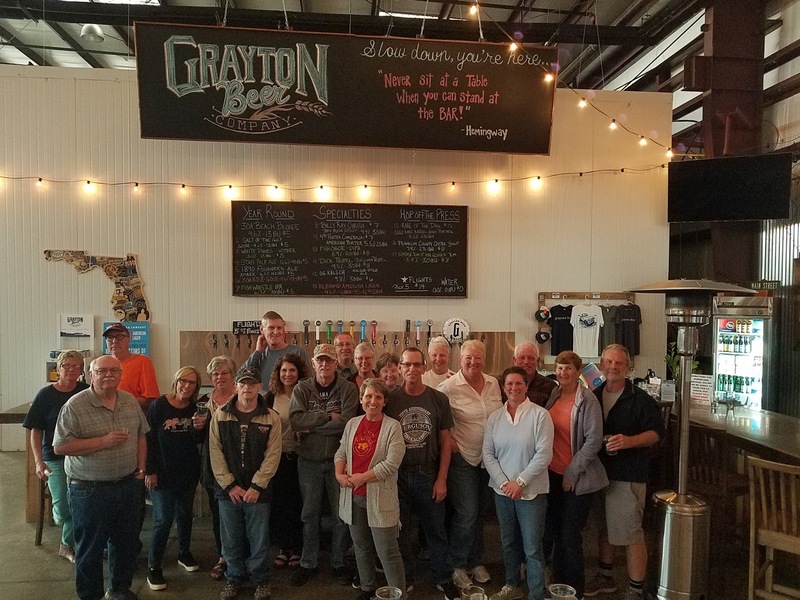 Kinston was a great example of how you come to a city or town for a specific reason but find there is so much more to explore the longer you stay. If you are traveling through eastern North Carolina and looking for some good places to eat and drink, you might want to stop in Kinston. 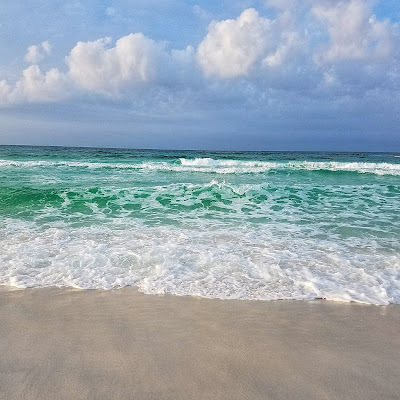 If you ask anyone about Camden who has visited there they will give you a delightful sigh followed by a heartfelt response declaring “Oh, I love Camden!” Coastal Route 1 cuts right thru downtown Camden so as you drive through you can’t help but be invited in for a closer look. As seasoned Maine travelers, we beg you not to skip Camden on your race up to Bar Harbor and quest to explore Acadia National Park. Instead, stop and enjoy this seafaring town and the neighboring and equally as charming town of Rockport. Downtown Camden is jammed packed with shops, galleries, and restaurants. Venture just off Route 1 and head down to the water where the harbor view is delightful and the flourish of boat traffic makes things lively. One of our favorite watering holes in Camden is Seadog Brewing Company where you can enjoy their delicious blueberry beer outside on the patio overlooking the harbor. Another favorite place to stop in Camden is Lily, Lupine, and Fern a fabulous flower and wine shop that has a diverse wine selection offering wines from all over the globe. 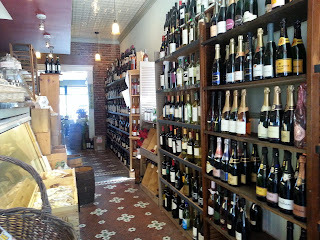 To boot, they have an awesome cheese selection which means this is your one stop for all your wine and cheese picnic needs. Camden has a super cute dog store, appropriately called “The Maine Dog” for those of you looking to spoil your favorite pup with a souvenir. Stop in the Swans Island Company store and check out their beautiful hand-woven blankets. French and Brawn Market Place is where you can pick up deli sandwiches, gourmet goods, meat cut to order, and other grocery and provisioning items. Sherman’s Bookstore is a treat with not only a great selection of books but other fun stuff you would find in an old 5&10. Long Grain is an eclectic Asian restaurant with great food and hard to find Asian culinary items. Stonewall Kitchen offers an extensive selection of products, including jams, chutneys, sauces, baking mixes, an assortment of kitchen accessories, fun gift ideas. And don’t forget about the Farmers Market which is so popular that it happens twice a week. Camden Hills State Park offers a great place to camp; as well as, some amazing views. If you like to hike, this 5,710 acre park will satisfy you as there are over 30 miles of trails that wind through the park, many of which have stunning overlooks. But, for you non-hikers who still want that great view don’t worry you have the option to take the auto tour road up to the top of Mt. Battie. Mt. Battie overlooks Penobscot Bay, an archipelago of outlying islands, interior lakes, and Camden Harbor. 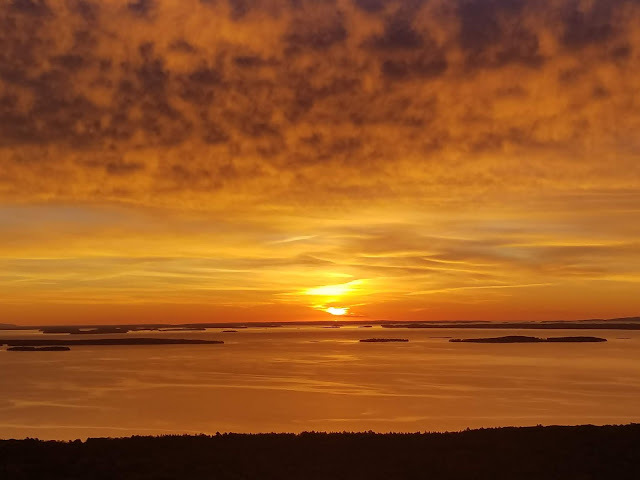 If you love sunrises, the top of Mt. Battie is the place to be for marvelous views. The park dates back to the 1930’s and was built by the Civilian Conservation Corps (CCC) under the direction of the National Park Service. Still standing today are many of those iconic CCC buildings that give the park added charm. 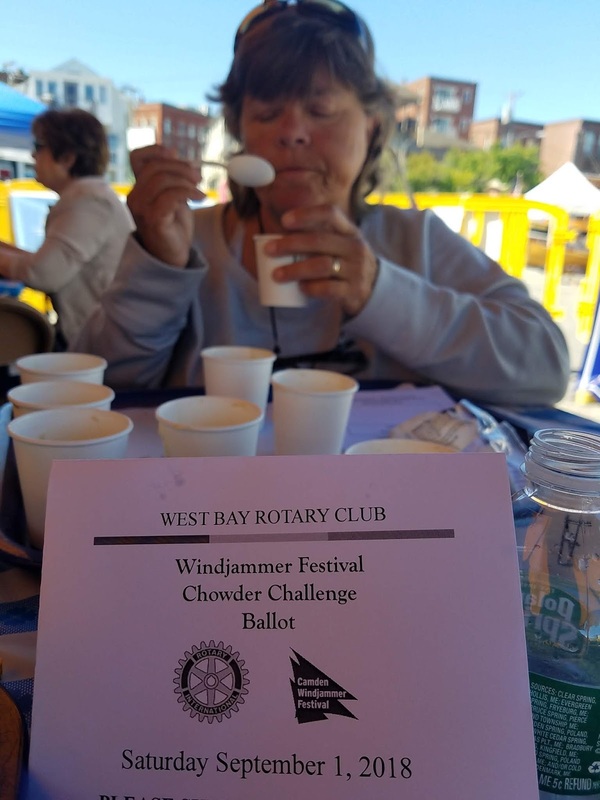 Camden Harbor is also referred to as the Windjammer Capital of the World and really comes alive during their annual Windjammer Days celebration. 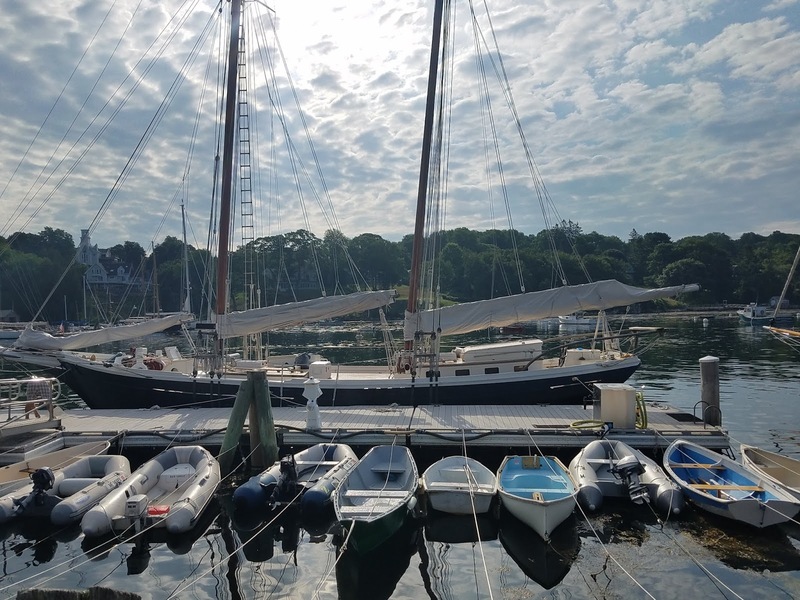 Nearly a dozen schooners (some dating back to 1918) grace the harbor and Penobscot Bay with their billowing sails and classic good looks. During the nineteenth century, Camden’s harbor was full of schooners, sloops, and scows year-round. These sailing vessels were major modes of transportation at that time and today take tourists on hourly, daily, and even weekly excursions. Windjammer Days is a weekend-long celebration jam packed with events. Our friends Pat and Debbie were in town so we decided to partake in the fun. 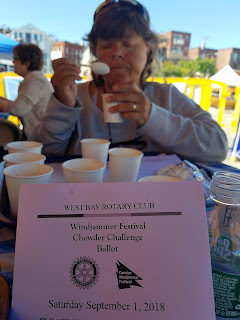 We started off with a chowder tasting which filled our bellies with rich tasty classic New England cuisine. After lunch we launched our paddle boards and kayak and paddled around the harbor so we could get an up-close view of the boats and events activities. Our timing was perfect and we made it over to watch kids participate in the lobster crate races. The object is simple – run across the string of crates as many times as you can within a certain time limit without falling in the water. Sounds easy, but a number of kids wound up in the drink soaking wet. Just south of Camden is the less busy and equally cute and tranquil town of Rockport. 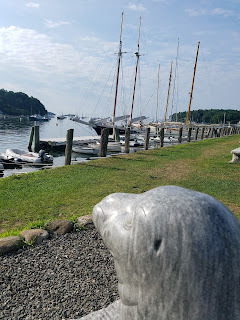 On the harbor in the Rockport Marine Park is where you will find two noticeable historic landmarks in the park – the lime kilns and a statue of André the seal. This area is part of the region's nationally significant lime processing history including seven historic early 19th-century lime kilns. The area was listed on the National Register of Historic Places in 1970. The elevated railroad line allows lime to be dumped into the top of the kiln. Three of these kilns still exist and may be visited. Fun fact: Rockport supplied most of the stone used in the U.S. Capitol Building in Washington DC after it was damaged during the War of 1812. André the Seal is a true story about a harbor seal pup who was raised by Harry Goodridge, a tree surgeon and the local harbormaster. Goodridge was looking for a seal pup as a companion to take with him when he dove. He had seen a newborn pup on the rocks who appeared to have been orphaned. A couple days later when Goodridge returned to the area, the pup swam over to his boat. André and Harry became companions who stuck together for 25 years, swimming together, sledding together, and even hanging out in the family bathtub and watching TV. André was more like a dog than a seal and learned all kinds of tricks. Word spread about André and people from all over the country came to Rockport Harbor to see him. André went blind in 1985 and when he swam away in 1986 he never returned. Searchers found his body washed up on a remote part of Rockport beach. At the time, he was thought to be the oldest living harbor seal. André was famous and his story was told in a movie, PBS documentary and a book. Many joked he was Maine’s longest running free attraction. A statue memorializing the seal sits proudly in the Rockland Marine Park. Debbie and I decided to paddle board around the harbor and out to the Rockland Lighthouse. 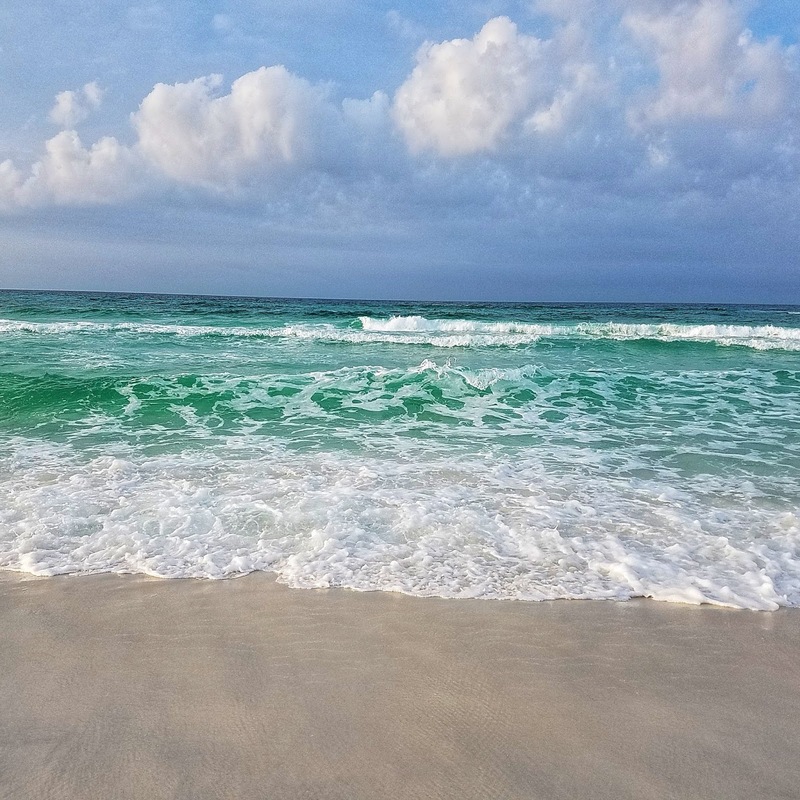 The paddle was beautiful and the water was extremely clear to which we were treated to magnificent views of starfish, clams, and other aquatic life and found some seaglass. Sometimes the best way to see a harbor is from the water and the paddle was definitely worth it. 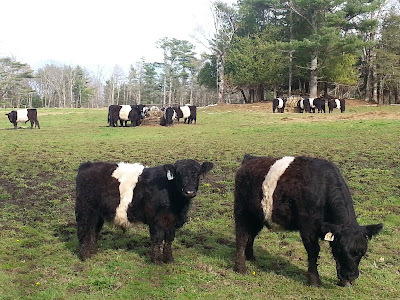 Rockport is home to Aldermere Farm which is known for their Belted Galloway cows. “Belties” as locals call them are unmistakable because of their black hair interrupted with a white band. Yep, just like an Oreo cookie – their other nickname. The 136-acre scenic farm is owned and operated by the Maine Coast Heritage Trust and stretches across some of the most beautiful lands of green pastures, undeveloped shoreline, woodlots, and wetlands. Aldermere works towards educating visitors on the importance of land conservation and sustainable agriculture and runs numerous programs for adults and children including a 4-H club, art shows, farm tours, summer programs and more! There was one place in Rockport where we spent a lot of time - Erickson Fields. Erickson Fields is a former dairy farm that is now a working farm where young people grow food for the community. We spent so much time there because there are off-leash hiking trails through the wooded section of the property. After our walks we would stop in at The Market Basket which is a European style gourmet market and that means it is a go-to for handmade pastries, baguettes, croissants, and more. So if you think Camden sounds like a fun little Maine town with lots of charm then plan to stop here ... at least for a few days. We just touched on a little bit of what Camden and the neighboring town of Rockport have to offer. 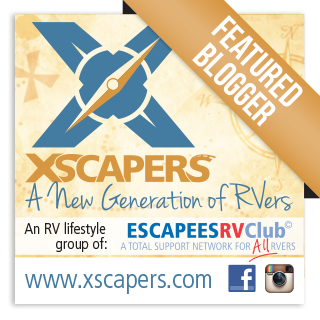 Have you ever considered becoming a full-time RVer but are afraid to jump in? Or, are you a “newbee” and find you still have tons of questions? We’ve been in both those scenarios and after eight years on the road, believe it or not, we are still learning. But here is a way to bridge the learning gap and hit the road with confidence. 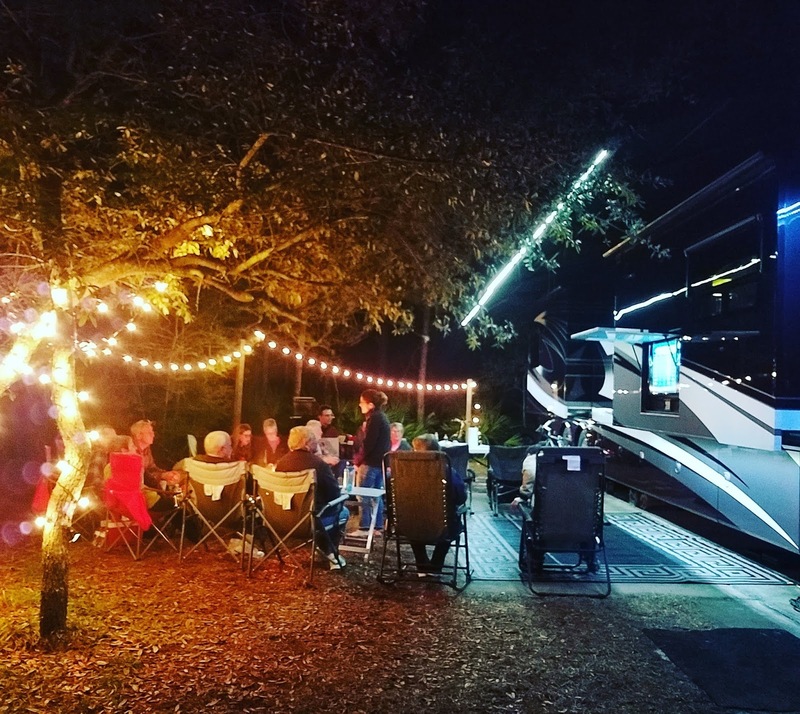 Our friends, Brandon and Kerensa, launched a Facebook group called RV to Freedom – Roadmap to Full-time RVing which helps guide you through the complex and unknown world of full-time RVing. The group quickly swelled in membership indicating that there is a lot of information people crave about full-time RVing. 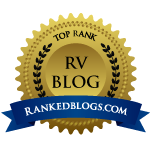 Kerensa and Brandon realized there was a need for more knowledge and insights to successfully transition into a full-time RV life and decided to launch a formal on-line course to delve into this subject. 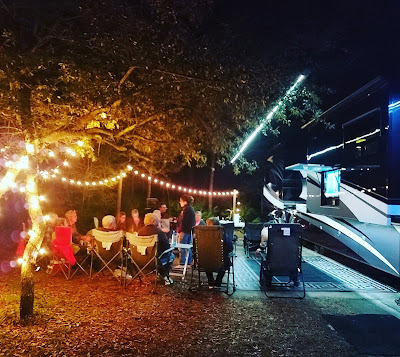 Roadmap to Full-Time RVing is a comprehensive 8-module series that will cover everything you need to know from how to find a suitable RV that meets your needs, how will you get mail, what opportunities for work are available, understanding the financial side of full-time RVing, and so much more. Plus you will get access to live video Q and A sessions which means all the questions you have will be addressed and answered by experts who have lots of knowledge to share. Sometimes you don’t even know what questions to ask, but they have that part covered in this comprehensive course. Betsy and I know Kerensa and Brandon personally and consider them friends and are confident that they will do an amazing job navigating you through this process. Below is a short introductory video which provides more details and to see if this course is right for you. About ten years ago (when we were “wannabees”), we attended a week-long course called “Life on Wheels” and it was the best thing we did preparing for RV living. We didn’t even have an RV yet but learned so much and felt the course was so valuable to our planning process! We believe this course will be super beneficial for new full-timers or those considering full-time RVing. So we loudly applaud our friends for enthusiastically wanting to help others and launching this course. Join RV to Freedom on February 13th 8 pm (Eastern) for a free informative webinar and get all your questions answered. Registration closes February 20th at midnight so don't delay. Here’s a great way to achieve your goal of full-timing with confidence from experienced people we know and trust. Click here to get started.